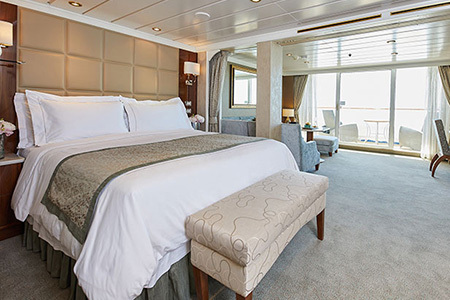 The Master Suite features a 2 spacious bedrooms with European king-sized Elite Slumber bed, 2 1/2 marble bathrooms, expansive living room, 2 private balconies, and walk-in closet with safe. 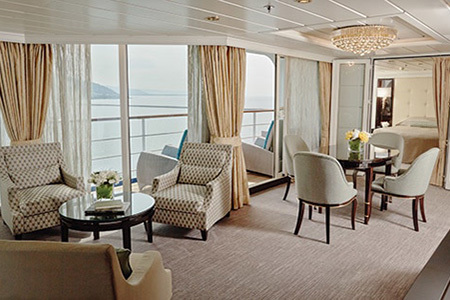 Accommodates up to 5 guests. 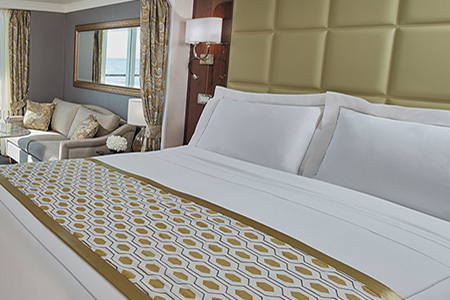 The Grand Suite features a spacious bedroom with European king-sized Elite Slumber bed, 2 marble bathrooms, expansive living room, private balcony, and walk-in closet with safe. Accommodates 3 guests. 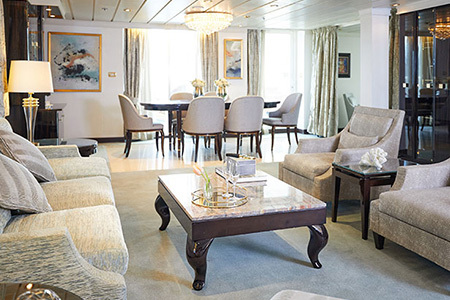 The Mariner Suite features a spacious bedroom with a European king-sized Elite Slumber bed, 1 1/2 marble bathrooms, expansive living room, private balcony, and walk-in closet with safe. Accommodates 3 guests. 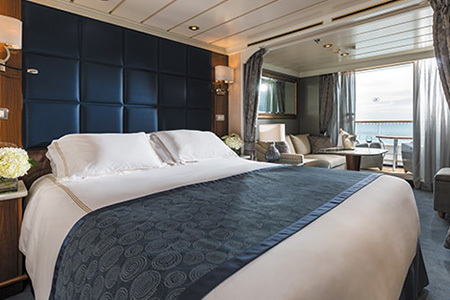 The Seven Seas Suite features a European king-sized Elite Slumber bed, marble bathroom, intimate sitting area, private balcony, and walk-in closet with safe. Accommodates 3 guests. 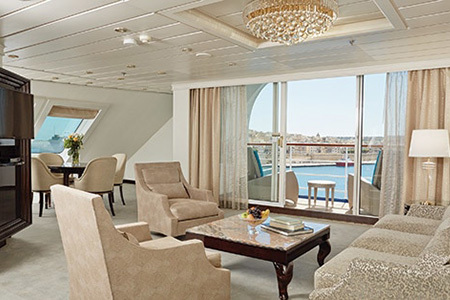 The Penthouse Suite features a European king-sized Elite Slumber bed, marble bathroom, intimate sitting area, private balcony, and walk-in closet with safe. Accommodates 3 guests. 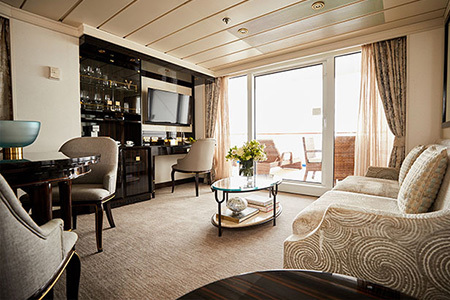 The Concierge Suite features a European king-sized Suite Elite Slumber bed, marble bathroom, intimate sitting area, private balcony, and walk-in closet with safe. Accommodates 3 guests. 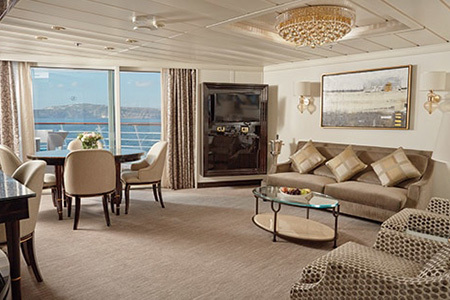 The Deluxe Veranda Suite features a European king-sized Elite Slumber Bed, marble bathroom, intimate sitting area, private balcony, and walk-in closet with safe. Accommodates 3 guests.